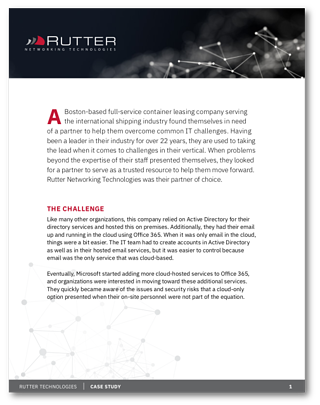 As a full-service container leasing company serving the international shipping industry, this company was looking for help with a common problem—the security risks that come with a cloud-only option. Like many other organizations, this company relied on Active Directory for their directory services and hosted this on premises. Additionally, they had their email up and running in the cloud using Office 365. When it was only email in the cloud, things were a bit easier. Without on-site personnel to address concerns with security, colocation facilities, device-level security, infrastructure as a service, on-premise to cloud migration, and downtime, their project appeared to be a daunting task. Control security loopholes on mobile devices used by a remote workforce. Configure Active Directory and Azure so that there was both security and the right level of access for employees to get their jobs done. Remove the hassle of creating multiple accounts for individuals for each instance and application they needed to log into.